Once a term applied to Limehouse, Chinatown now identifies the compact neigh­bourhood around Gerrard Street and Lisle Street, north of Leicester Square. The Chinese call Gerrard Street Tong Yan Kai, ‘Chinese street’. A handful of Chinese restaurants were estab­lished in Soho during the Second World War, when they became popular with soldiers who had acquired a taste for the food abroad. Later, Chinese entre­preneurs began to buy up and convert the rundown properties south of Shaftesbury Avenue. This coincided with an influx of agricul­tural workers from Hong Kong, who had been forced out of their tradi­tional occupa­tions by changes in the world rice markets. Many found work in the catering trade, often living nearby in tied accom­mod­ation, and a variety of other businesses sprang up to serve the new population. 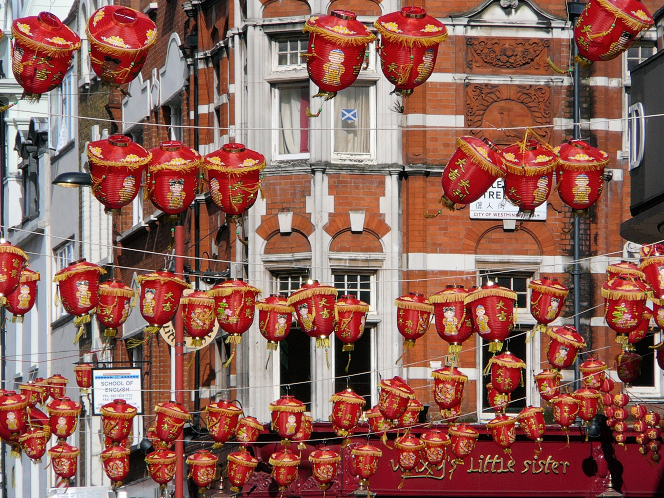 Increasing prosperity has allowed most members of the community to reside further afield but Chinatown’s role as a trading zone is stronger than ever, catering to the Chinese population from all over south-east England – as well as to curious tourists and hungry Londoners in general. There are oriental arches at each end of Gerrard Street, the street signs are bilingual (as are the notices in the bookmakers) and the telephone kiosks are miniature pagodas. Westminster council has pedes­tri­anised Gerrard Street and parts of Macclesfield Street and Newport Place. Since 1973 the Chinese New Year has been celeb­rated on the Sunday closest to the New Year with lion dances and other festiv­ities; the date of the New Year usually falls between mid-January and mid-February, varying because it depends on the phases of the moon.